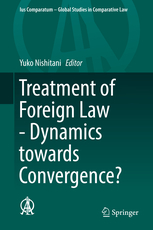 T he book Treatment of Foreign Law – Dynamics towards Convergence? (Springer, 2017), edited by Professor Yuko Nishitani, has just been published. It includes one general report and 30 national reports on the treatment of foreign law in diverse jurisdictions. Additionally, the book includes a report by the Hague Conference on Private International Law on the state and progress of its envisaged project on the treatment of foreign law. The general report and most of the individual reports were prepared for the 2014 Conference of the International Academy of Comparative Law held in Vienna. Further information, including a table of contents, is available here.